It' time to get In Tune with your 1999-2010 Ford Powerstroke! We have it just what your looking for here at PDOffroad. The Diablosport i2020 i2 inTune Performance Programmer gives your 1999-2010 Ford Powerstroke the performance you need when it matters the most. If youâ€™re a horsepower junky and you need a fix, look no further. 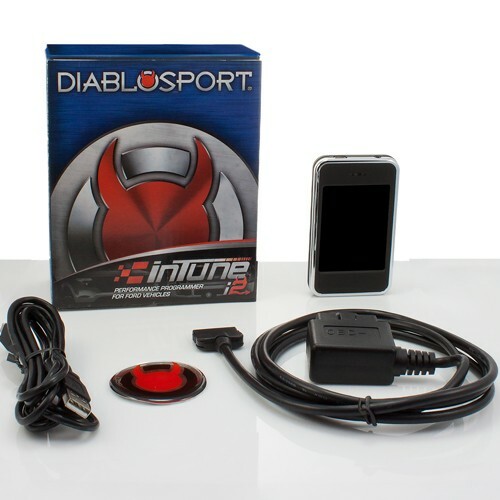 DiabloSportâ€™s number one goal is to make it easy to upgrade vehicle performance with the inTune i2 performance tuner. Itâ€™s an easy way to boost your trucks power without even popping the hood! If youâ€™ve ever wished you could buy a performance upgrade that makes the throttle more responsive, optimizes shift patterns, or even adds some bottom-end horsepower, youâ€™re in luck- the i2 tuner is loaded with cutting edge performance programs and vehicle adjustments that optimize performance. How hard is the install you ask? Sometimes the latest vehicle technology can be tricky- heck, sometimes there are so many buttons, knobs and levers in our vehicles that we donâ€™t even know what they do! With that in mind, DiabloSport developed a new mode on the i2 tuner called â€œEasy Tuneâ€ which takes the guess work out of installing your performance tune. Easy tune prompts the user to select the type of fuel theyâ€™re running, asks if they want to remove their speed limiter, or change tire size, and installs the tune in minutes. No more choosing from a long list of options!